Fine Dining with a copious wine cellar and full service bar along with the rustic ambiance makes this restaurant a hidden jewel in the Antelope Valley. Let our family at “the Hill” make your special day memorable. Banquet room and dining room for corporate luncheons, private events, and meetings is available upon request. 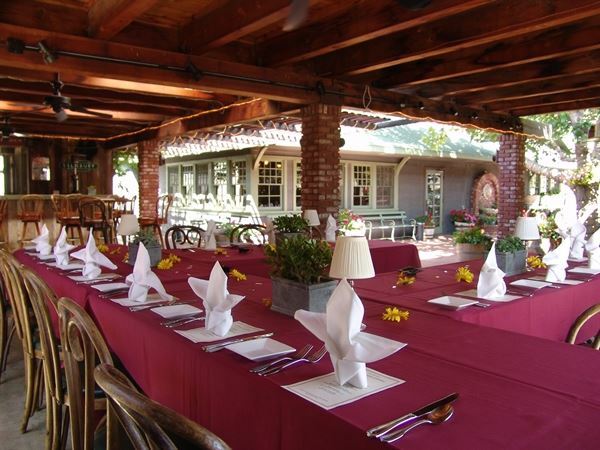 The Garden Patio offers quaint elegance with the ambiance of an intimate garden party. It is ideal for a wedding ceremony and reception for up to 150 guests. Our beautiful Garden Patio has a full bar, water fountain, fireplace, heaters and room for entertainment and dancing to boot! Leading off “The Patio,” our banquet room provides an intimate setting for your rehearsal dinner, accommodating up to 40 guests.